The Western Cape is a wonderful destination for a safari holiday because you can combine Big Five game viewing with the beauty of the Cape Winelands, and the diverse flora of the Garden Route. Whether you are looking for a chance to see Rhino, Leopard, Buffalo, Lion and Elephant at one of the unforgettable Big Five Safari Lodges or want to let your children experience the wonders of nature while on a Family safari holiday, the Western Cape is the ideal place to go. 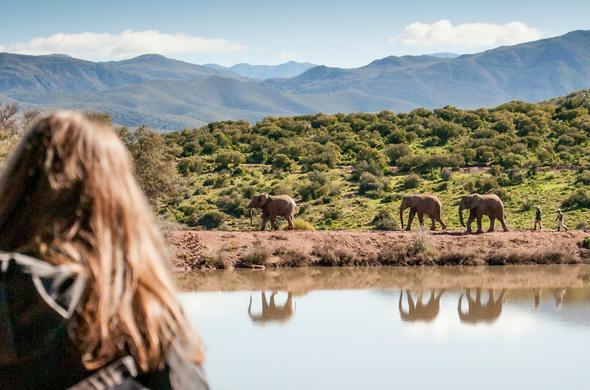 Each Western Cape Game Reserve and National Park offers guests different experiences, from horseback safaris, game drives and quad biking adventures in Aquila Game Reserve to peaceful and relaxing Nature Trail walks in the Karoo National Park. Table Mountain National Park is a must for anyone to visit. It is recocgnised as one of the world's most remarkable attractions, with Table Mountain being named one of the Seven Wonders of the World. Combine your Big Five safari with one of the world's most diverse floral kingdoms, just a short distance from Cape Town, Western Cape, South Africa. Spectacular scenery and safaris can be integrated with visits to Cape Point, the Cape Winelands or Garden Route. South Africa's Western Cape is the country's top tourist destination. Experience "the Big Seven". Add Whale watching and Shark spotting to your safari. Until recently, the Western Cape has not really been associated with big game safaris. Now, local conservation efforts have re-introduced The Big Five and other animals to lands that they once roamed. Each one of these Western Cape safari lodges featured here is different. Ranging from stone built rondavel to colonial cottage to magnificent waters edge lodge. In between there are luxury tented camps and and hilltop bungalows. The Western Cape has a style all of its own which in all likelihood stems back to the original Dutch settlers. Where ever you eventually arrive, you can look forward to old Cape hospitality and good food served with world-famous Cape wines.